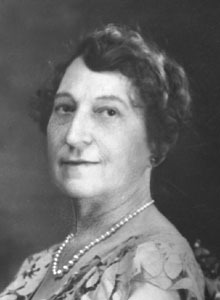 Carrie Gertrude Gilbert (1871-1947) was chair of the music program for the Panama-California Exposition. She and her sister Bess were fixtures in San Diego’s music world for half a century. Gertrude was a charter member of the Amphion Club in 1893 and was its long-time president when she was appointed chairman of the Music Committee of the Woman’s Board in which role she directed the musical programs for the Exposition during its 2-year run, arranging for the appearance of musicians and concert artists. In 1933 several of the “temporary” Exposition buildings were condemned and orders were given that they be demolished. Citizens protested for they had come to love these remaining buildings from the 1915-1916 Exposition, collectively known widely as Balboa Park’s “Dream City.” Gertrude campaigned to save the condemned buildings and eventually prevailed. Nearly all the condemned buildings were saved and put to use for the California Pacific Exposition in 1935-1936. Four of those buildings have now been reconstructed in permanent materials. For this reason The Committee of One Hundred’s Preservation Award was named after her.